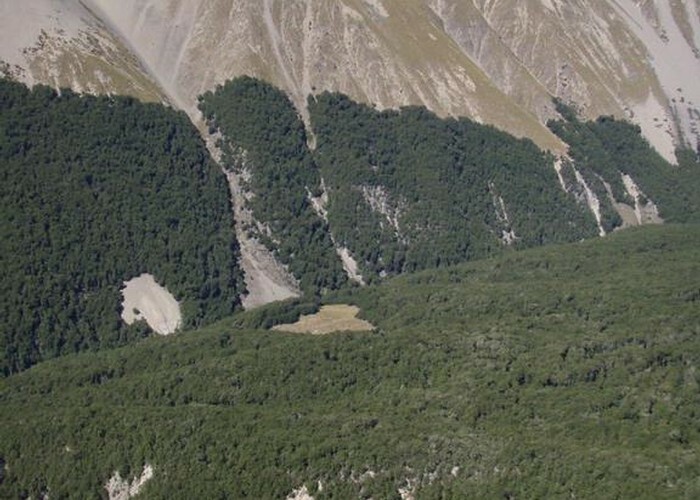 Maitland Hut is a typical 4-bunk forestry style hut in the Maitland valley. The hut's in a large clearing in the beech forest and as such nice and sunny. Most visitors are here to hunt the Maitland hunting block - red deer, tahr and chamois being present in the area in low-moderate numbers. However, the valley also offers an easy low-altitude route from the Hopkins to Ahuriri via the Maitland and Snowy Gorge valleys. Access up the Maitland from the Hopkins follows a farm track and permission is required off Lake Ohau Station. Alternatively a route crosses from the South Temple via the saddle at 2251400, 5667100. This route is entirely on public land and DOC's comment was that it is also faster than the private track. Into the Ahuriri there's two main options: over the low saddle upriver to Snowy Gorge Hut and then the Ahuriri. Alternatively you can climb either of the ridges to the west of the hut and drop into the Watson over the moderate saddle. Maitland Hut • By madpom. Licence: cc by. Added 13 May 2009 by madpommadpom. 2 revisions, most recently 22 June 2011 by iangeorgeiangeorge.